CardsDirect, LLC (http://www.CardsDirect.com), the online leader in custom imprinted and personalized greeting cards is pleased to be able to support worthy charitable causes. 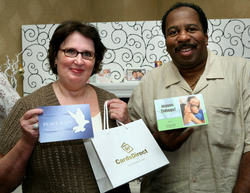 Greeting cards are donated to those who can use them and unused cards are received and repurposed. CardsDirect is also pleased to partner with deserving charities by donating profits from personalized greeting cards sold on the CardsDirect.com website. I just received your package today. THANK YOU for the generous donation. We are overwhelmed by the number of cards you sent. May God bless you and your company. CardsDirect, LLC, the online leader in custom imprinted and personalized greeting cards is pleased to be able to support worthy charitable causes. Greeting cards are invaluable social networking tools that every business can benefit from and CardsDirect is pleased to be able to donate cards to worthy charities and non-profits that can put them to good use. CardsDirect is also proud to sponsor partnerships on new custom imprinted and personalized cards with a portion of proceeds going to deserving non-profit organizations. Through the “CardsDirect Recycling and Reuse Program”, cards are received by CardsDirect throughout the year and are then donated or recycled. So far in this year alone CardsDirect has donated over 100,000 all occasion cards to organizations and non-profits for their use. The majority were Holiday Cards donated to organizations that will sponsor drives throughout the year to have the cards signed and forwarded to our troops overseas during the upcoming holiday season. CardsDirect has also donated Thank You Cards to animal rescue organizations like Straydog Inc of Eustaces, TX, and cards for all occasions to such charities as Adopt a US Soldier and prison ministries and substance abuse centers such as the Elayne Hunt Correctional Center in St. Gabriel, LA, Walden House, Inc. in Los Angeles and TROSA in Durham, NC. Birthday Cards were donated to the American Cancer Society Relay for Life Team at Wythe County Community Hospital, Wytheville, VA and thousands of usable card faces were donated to St. Jude’s Ranch for Children for their Christmas Cards recycled card program. In keeping with CardsDirect’s mission to help those in need, CardsDirect proudly sponsors a selection of greeting cards on their website for which a percentage of the proceeds are donated to partner charities. These charitable partners include The Leukemia and Lymphoma Society, Cystic Fibrosis Foundation, National MS Society- Main and South Florida Chapters, For the Troops, and In Defense of Animals. CardsDirect invites you to visit their website to see the card designs that benefit these charities as well as the over 2,000 card designs in categories from Photo Cards to Invitations to affordably priced Value Cards for all occasions. For those interested in donating unused cards or for those non-profits that would like to request them for use or are interested in participating in a charitable partnership, please contact CardsDirect at Support@CardsDirect.com or by calling toll free 866.700.5030. In our current economic environment, reaching out to individuals and businesses through the sending and receiving of personalized greeting cards is now more important than ever and CardsDirect is pleased to be instrumental in helping businesses and charitable organizations do just that. Founded in 1998, CardsDirect, LLC is a catalog and internet-based social expression company headquartered in Plano, Texas that has grown into one of the most trusted online resources for custom imprinted card products. Whether it is 25 cards or 25,000+ cards, CardsDirect gives all orders the personal attention they deserve. CardsDirect offers custom printed greeting cards for consumers and businesses including Photo Christmas Cards, holiday cards (Thanksgiving Cards, Hanukkah, New Years, etc. ), photo cards, thank you cards, value cards, anniversary cards, birthday cards, invitations, announcements, assortment packs and more. CardsDirect provides an easy ordering process, value pricing, and first class customer service for thousands of businesses including all 100 companies on the Fortune 100® list. CardsDirect has been recognized nine years running as a distinguished dealer, winning numerous awards from industry leaders and manufacturers. The CardsDirect team is always striving to provide a positive, easy and enjoyable card buying experience.